This summer travel season, more pets will hit the road with their owners than ever before. According to the American Pet Products Manufacturers Association (APPMA) more than 15 million Americans travel with their pet each year. And, expanding on this trend, are a growing number of companies catering to an increasing demand for pet-friendly travel products and accommodations. "With more and more people considering their pets as members of the family, a growing number of companies and service providers are also embracing four-legged companions, said Bob Vetere, COO and managing director of APPMA. In fact, in its latest pet traveling guide, AAA lists more than 12,000 lodgings that accept pets, up eight percent from last year -- double the increase from the year before. Along with these new pet-friendly hotels and airlines, pet adventure outfitters, and travel agencies, hundreds of innovative products are hitting store shelves making a journey with man's best friend more convenient than ever. Here are a few top picks. 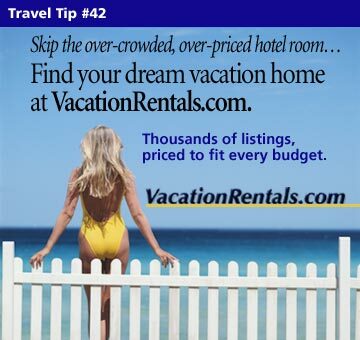 Vacation Rentals .com offers many pet friendly vacation lodging options. Call ahead to make sure that your pet will be welcomed wherever you are staying. Make sure your pet's vaccinations are current and that you carry summarized medical records. Many places may require a health certificate. Have identification on your pet at all times with a phone number and area code in case your pet decides to take a vacation of its own. Check with local veterinarians about local hazards such as toxic plants, ticks and heartworm, Lyme's disease or rattlesnakes. If your pet is a creature of habit, take the pet's usual food and some of the pet's toys with you.